This piece could be used as a sewing box or as a place to hide some treasures. The bed frame has been stained and holds a mattress made from a cigar box. 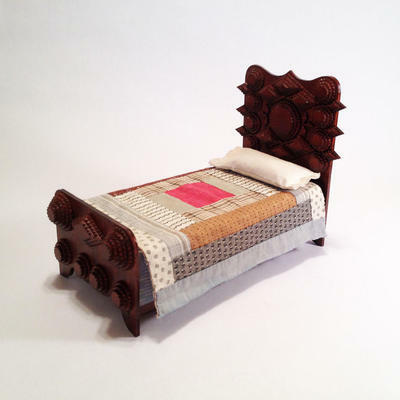 The bed cover is an antique Civil War quilt square and the pillow is made from muslin and stuffed with sawdust. Once you "turn down" the covers you can see the mattress ticking. The top of the mattress lifts open to store your treasures. Approximately 106 pieces of hand cut and chip carved wood were used to create this original work of art.